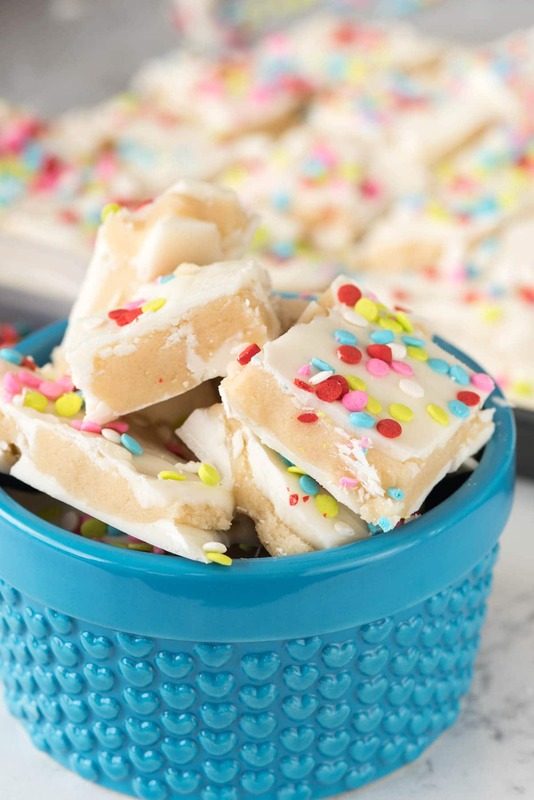 This sugar cookie bark is a combination candy and cookie dough – and will curb your sweet craving for sure! I bet that, if you’re a blogger, I could say the name of an ingredient and you could immediately spout at least five things to make with it. It would be like brainstorming gone mad. But what about when the ingredient is the dessert? Makes it a little harder. Like, for example, sugar cookies. When I think “sugar cookie,” I think cute designs and royal icing. I think about Christmas. 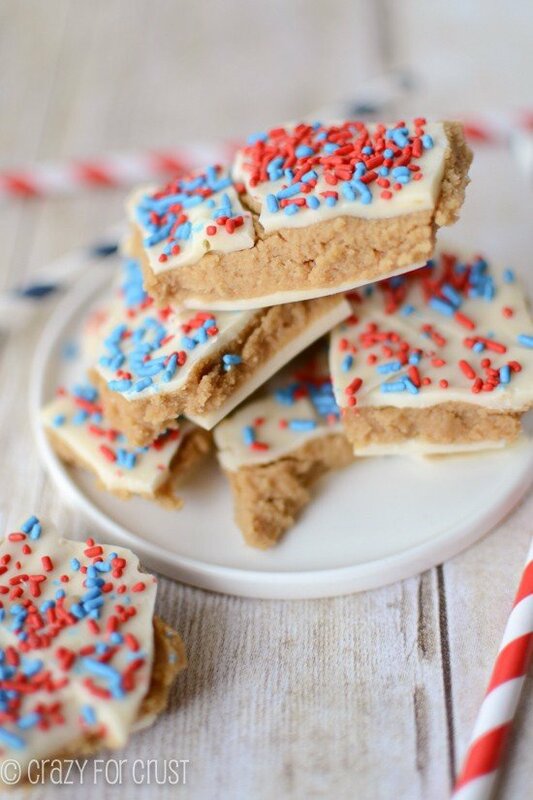 But if you want a treat that actually tastes like a sugar cookie, it’s a little harder. My step-father-in-law (that’s a mouthful, let’s call him M), loves sugar cookies. So, every year for his birthday and Christmas I make him some. But really, I can’t just make sugar cookies anymore. In blog-land-life, when you make stuff like carrot cake cinnamon rolls and ICEE cupcakes, you can’t just make a sugar cookie a second time (says the little voice in my head). Besides, I did that last year. But I made it a bar cookie. So this year, when M’s birthday rolled around I was stumped. And then I remembered Shelly’s Brownie Batter Bark. And I realized how I’d create another good sugar rush for the man who can eat an entire batch of cookies without gaining an ounce. 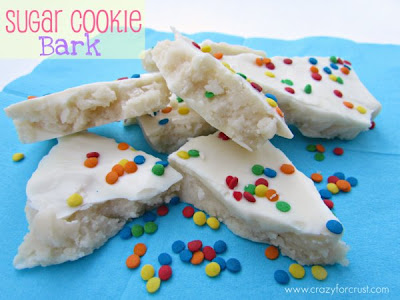 Enter sugar cookie dough and white candy melts. Add some sprinkles and you’ve got a super sweet sugar cookie dessert. That’s not a sugar cookie. But it kinda is. I can’t wait to try the other options for this. I’m sure it involves Reese’s Peanut Butter Cups. 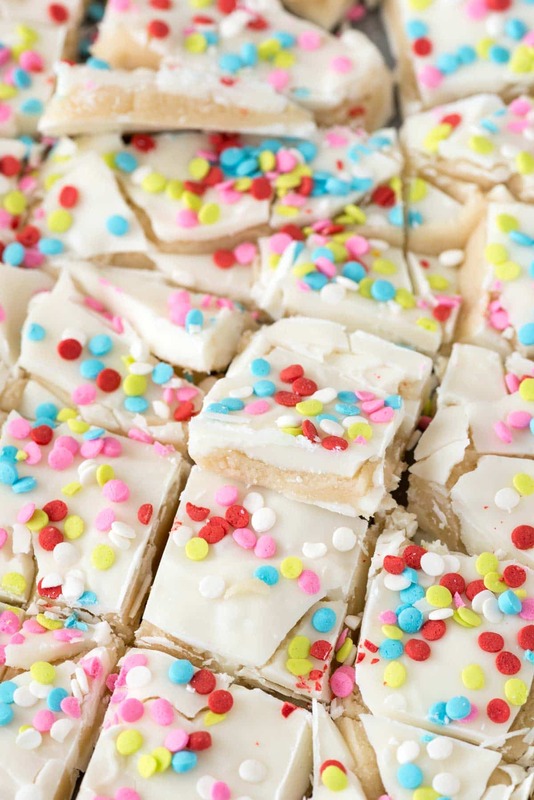 Make a from scratch (or take a semi-homemade step) and make a no-bake sugar cookie bark! Leave out the eggs and you've got an edible cookie dough sandwiched between white chocolate - the perfect sugar cookie for summer! Semi-homemade version: use a pouch or box sugar cookie mix — the kind that calls for 1/2 cup butter and make as directed, substituting 1 tablespoon milk for the egg. Cream butter and sugar, then mix in vanilla, milk salt, and flour using a hand or a stand mixer. Mix until a cookie dough forms. Line a cookie sheet with wax or parchment paper. Spread half the chocolate into an approximately 8x10 rectangle on the cookie sheet. 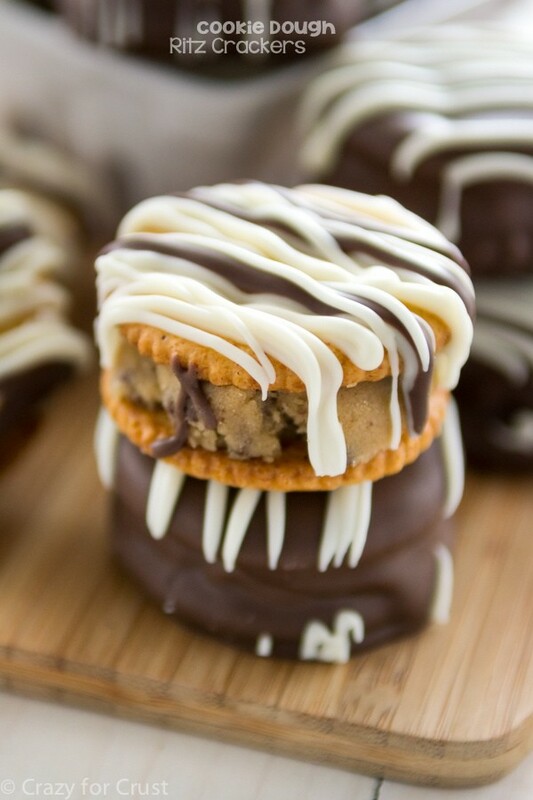 Scoop handfuls of the cookie dough and flatten them between the palms of your hand, then place onto the melted chocolate. Cover the entire rectangle, leaving a small border around the edges. 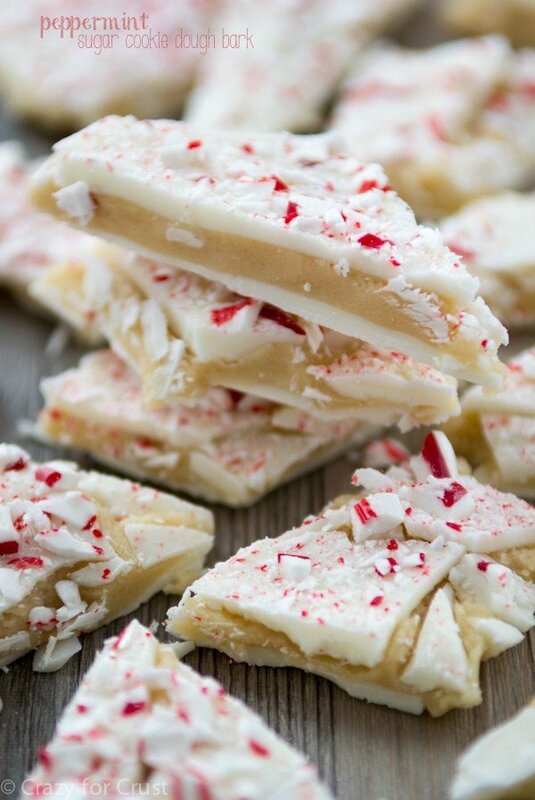 Spread remaining white chocolate over the top and sprinkle with sprinkles, as desired. Chill until firm. Use a knife to cut into pieces. Store in the refrigerator, serve room temperature.